This year, Wayne Local School is offering for the first time: The Seal of Biliteracy. 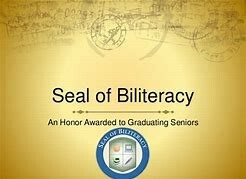 The Seal of Biliteracy is an award given by our school in recognition of students who have studied and attained proficiency in two or more languages by high school graduation. Why is the Seal of Biliteracy Important? The Seal of Biliteracy provides evidence of world language skills that are attractive to future employers and college admission offices. Also, a notation can be made on the student’s transcript and a seal can be given on their high school diploma, marking their achievement. Wayne Local schools is using a nationally known company called Avant. Students and their families will purchase their assessment from Avant’s online store, and our staff here at Wayne Local will proctor and administer their assessment for them.